As I’ve relayed before in a fabulously embarrassing post about the night Toby escaped – she came to us fully flighted, which we did not expect. It didn’t really change our taming plans at all, because she was not a handfed baby we anticipated spending weeks with her in her cage getting adjusted to people and the concept that we weren’t interested in eating her. Also, I’d already read up on the debate and decided that we would keep Toby as a flighted bird. It’s always seemed very natural to us for Toby to fly, but it did change our lifestyle dramatically. She spends about 2 to 2.5 hours out of the cage most days, minimum, and during that time we don’t typically eat or have drinks in glasses without lids, we never cook with her out and we are always very careful about opening and closing doors and being aware of where she is hanging out. If we want to have a mug of coffee in the mornings we make sure the mug is tucked away somewhere instead of out in the open. Initially, we were more lax; the no food rule happened after Toby landed in my bowl of cereal one morning and then tried to climb in my mouth for another taste! We also have to be careful about making large arm gestures with Toby out of the cage; it’s too easy to tap her mid-flight. All of the precautions have been totally worth it for us, the feeling I get when Toby comes flying to find me in another room is priceless, and it’s easy to see that flying is the best part of her day and, in my opinion, integral to her existence as a bird. I think it’s helpful also for her to be able to go back to her cage when she’s scared and generally to know that she can get herself out of trouble and never ends up somewhere she doesn’t want to be. Having Kelly come to us clipped has been a wildly different experience. In some ways it’s been good to skip over a bit of the taming process. Even if she was not handfed, we’ve be able to handle her as much as we wanted, and she would have very little choice in the matter. Which sort of bothers me, actually, I don’t like thinking that we are just imposing ourselves on her. It’s also sad that she can’t get where she wants to go – she attempts flight and can only glide (somewhat) gently to the floor, any time she’s out I’m usually trying to guess where she wants to go and put her there, and then trying to guess when she’s bored, or when she needs to go home and eat or drink. I feel like her free will outside the cage is nonexistent. I can’t say how much I’m putting my feelings into this, but I think that Kelly sees Toby flying and is really frustrated that she can’t follow. So, having just one clipped bird or multiple clipped birds together might be a lot easier, maybe they don’t know what they are missing in that case, and they are equally able. Kelly’s not being able to fly also seems more dangerous to me because she can’t get herself out of some situations. She’s jumped off the window perch a few times and landed behind the kitchen sink faucets. Or she ends up on the floor and can’t get back up to the cage or play gym. We’re always there to help her back up or get her out of whatever mess she’s in, but in the long term I’m sure we would relax and accidents could happen. Also sometimes with Kelly’s light color you can hear her head ground-ward but can’t quite find her right away. Fortunately she enjoys walking around on the floor! The other piece of this is that just because Kelly is clipped and was handfed doesn’t means she likes people, so far she mostly regards us as over-bearing inn keepers. She needs us for basic necessities but she’d prefer if we left her alone otherwise. Currently Kelly is going through her first molt, she’s lost the bars on her head already and every day we’ve got a blanket of feathers on the ground around the cage. We’re hoping that some of her previously clipped feathers are part of the molt and she’ll have more mobility soon. It may seem counterintuitive, but I think that once she can fly and really hang with Toby she may start to find us a fun perching option instead of an unavoidable mobility aid. 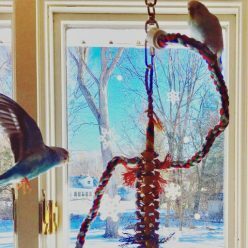 Much like the great seed vs. pellet debate, people on both sides of this issue are quite convinced that their way is best, and least dangerous for the parakeet. 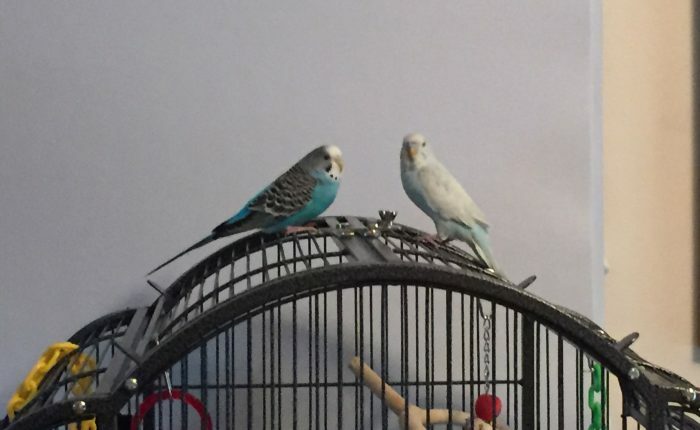 I think that having flighted budgies does mean making a lot of adjustments, but parronthood in general equals huge household changes, and as far as I’m concerned, it’s worth it to make sure your parakeet can fly both for his physical and mental health. Next Next post: Does molting make a parakeet sick?